It’s a familiar story. Police and emergency services inundated with phone calls from concerned members of the public who have heard or seen something unfamiliar in the sky. Last month it was a spectacular fireball meteor. This month it was a loud explosion that some people feared was either a giant earthquake or a bomb blast. The result was flood of calls to the police and fire services in Warwickshire, Somerset, Oxfordshire and the West Midlands. Some reported buildings shaking, windows rattling and a sound ‘like sitting on a hard shoulder and big lorry going past.’ Accounts from some of those who raised the alarm can be found on the BBC News website here. Mystery booms and ‘phantom aircrashes’ are nothing new. They have become so common since the Cold War that they have become a new type of rumour legend. 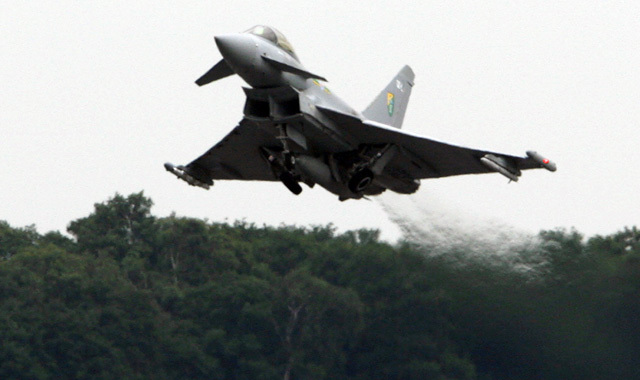 The BBC reported that in January this year, MoD confirmed that a loud noise heard by people in the north of England was caused by a RAF fighter jet breaking the sound barrier. Back in March 1997 I reported on a classic incident of this kind whilst working for the Sheffield Star (see my webpage on ‘The Howden Moor incident’ here). On that occasion people in the west of the city, on the edge of the Peak District National Park, called 999 after seeing a low flying aircraft, followed by an enormous aerial explosion. Naturally they feared an aircraft had crashed into the Peakland hills. Police, fire services and mountain rescue teams scoured the Howden Moors for 18 hours and were joined by a RAF Sea King search and rescue helicopter, but found no trace of a crash. But the aerial explosions were so loud they were recorded by the British Geological Survey who confirmed they were most likely to have been caused by an aircraft breaking the sound barrier. As today, rumours spread rapidly: were the RAF chasing UFOs over the Peak district? had a secret military aircraft crashed and been covered up? In fact, no aircraft crashed because the pilot responsible landed safely at a RAF airbase long before the police and mountain rescue teams even left their beds. A year later I persuaded my MP Helen Jackson to ask questions in Parliament about the incident and she obtained an admission that RAF were involved in a low-flying exercise that night over the Peak. It was impossible, they said, to confirm they were responsible for the bang so long after the event, but the conclusion was obvious. I later obtained a copy of a report produced by the RAF police that confirmed my suspicions but cleverly avoided attaching blame to anyone (the cost of the pointless search and rescue operation to the taxpayer was estimated at £50,000). Even today the story is regarded as a ‘unsolved mystery’ and frequently turns up in compendiums of UFO legends and local folklore (most recently in Jonathen Skew’s Sheffield: A Pocket Miscellany, 2011). But the truth has always been out there. This entry was posted in Uncategorized and tagged BBC, British Geological Survey, Helen Jackson MP, Howden Moors, Jonathen Skew, Ministry of Defence, mystery bang, mystery boom, Peak District, RAF, Sheffield, Sky News, sonic boom, Typhoons, UFOs. Bookmark the permalink.